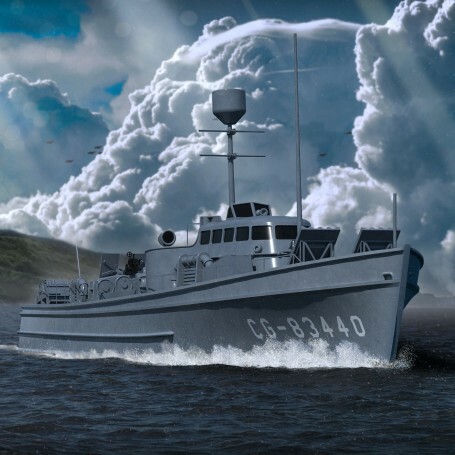 Kit to build one model of one 1/144 US Coast Guard 83’ patrol cutter. Includes resin parts, photoetch fret, decals, brass parts, and one 3D printed 20mm Oerlikon. A complete kit to build one 1/144 model of a US Coast Guard 83’ Patrol Cutter. This kit includes resin parts, a photoetch fret, a decal sheet, some brass parts, and one 3D printed 20mm Oerlikon Mk4/0 gun. - Anti-submarine patrol boat (Measure 13). - D-Day fit, 6th June 1944 at Normandy (Measure 14). 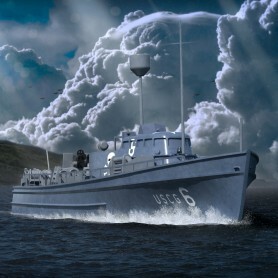 The sixty 83' Patrol Cutters that formed Rescue Flotilla One during D-Day were modified to some extend to fill their role of rescue ships during the landings. Mousetrap rails, D/C launchers and some ammo boxes were removed, while in some instances more balsa rafts were secured on railings or pilot house. Camouflage was changed to the darker Measure 14, and pennant numbers replaced by codes from 1 to 60. CGC-6 is famous for her skull and crossbones emblema on both sides of the pilot house. The instructions and paint guide are based on some examples. It is recommended that modeler should do some research to model a specific cutter. Instructions notice for this model.